Our 2016 Annual Appeal is underway! 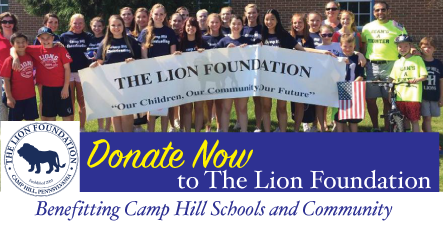 Your donations to The Lion Foundation fund programs and projects that inspire and support educational, athletic, and cultural programming in Camp Hill. These are programs that tax dollars simply no longer cover. Donations are tax-deductible. All donations have an impact on the lives of our students! Annual Appeal donations ove​r $75, if made by September 30, receive your choice between a Pollock Performing Arts Center Priority Arts Card or a Camp Hill Athletic Pass. We at The Lion Foundation cannot thank you enough! ​CHSD Athletic Passes are good for all 2016-2017 home regular season sporting events.